Ashna Poudel is a high school senior from Kathmandu, Nepal. She describes herself as a self-driven person who effectively communicates with others to generate solutions to social problems in Nepal. She not only wants to change her community but wants to be the change in this world. Poudel spearheads Sukarmi, a project that provides skills training and paid employment to Nepalese girls who want to become independent. In 2017, Poudel was highlighted as one of Glocal’s 20 under 20 for her social work in empowering women and children in their communities. Poudel portrays her experiences as a social worker in Nepal in her writing. 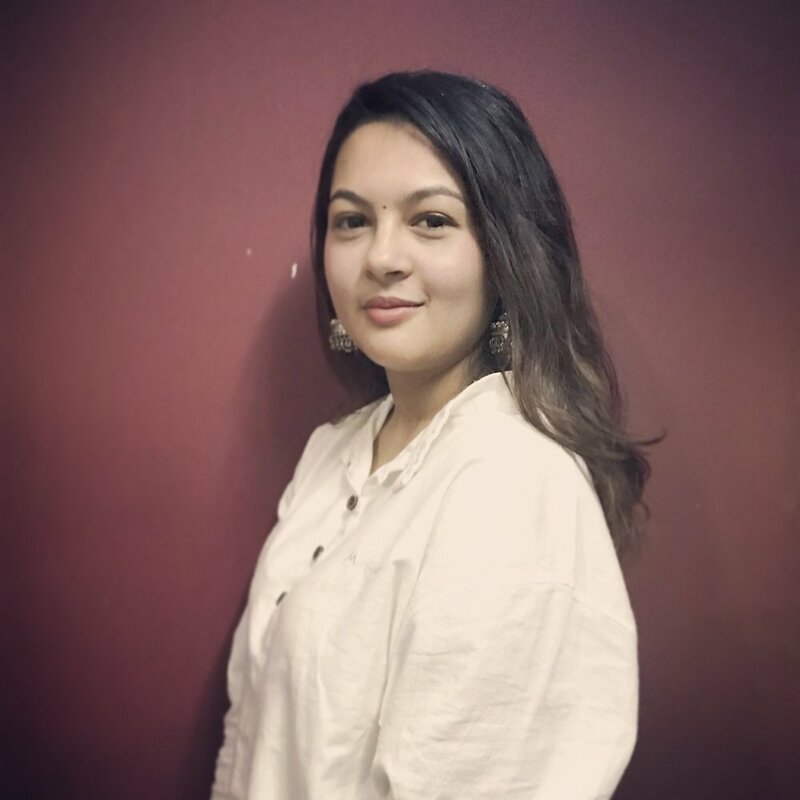 She enjoys working with words and has published various articles on Glocalkhabar, one of the leading online portals in Nepal. She states that, like many others, she has faced economic crisis since childhood. Poudel says defeating this hardship and spreading awareness to the world has made her stronger and ready to face anything in life. Though Poudel has risen above economic hardship, she recognizes that one of the major ways to help others out of poverty is to provide equal and free access to quality education and abolish the concept that education is a capitalist business, which she believes is true of Nepal’s education system. While in a science camp at a public school, Poudel was dismayed to find that many of her peers did not know basic terms in biology and instead had committed most of the coursework to memory. She feels that students in Nepal are mostly taught to score high marks on exams instead of truly examining and understanding each subject as a whole. After the camp, Poudel met with the instructor in hopes of convincing them to teach in a way that encouraged understanding of the subject and not only to pass a test. Poudel plans on pursuing her undergraduate degree in Nepal and continuing her work in social justice. What do you do when you’re trying to find a solution to a problem? What do you do when you have to find a very good solution and you have no idea? You start telling yourself to ‘think out of the box.’ To start thinking creatively and imaginatively sounds easy and simple, but is actually very hard to do. Any inventions that have ever been created weren’t just something that was already drawn out on a piece of paper for the inventors. They had to think. They had to imagine the masterpiece before it was even a physical object. These people weren’t just thinkers or inventors. These people ‘thought outside the box’ and so it was possible. There would have never been iPhone if Steve Jobs hadn’t thought of combining a computer and a phone in one device. We would have a phone for sure, and it might even be as thin as a paper, but that would only be a phone and not a multi-purpose device. He thought out of the box and because of that revolutionary idea, now we use phones for almost everything. This applies to all of us in every step of our life. It’s not easy to think creatively or to think out of the box. You need to practice. You need to know how to get out of the box, where to go, and how to come back inside the box because that is where we live. We live in boxes with full comfort. We don’t tend to go out of that safe zone. To think out of the box is the state of mind between what you know and what you haven’t still found out or is yet to be found out. So, before you say let’s think creatively or think out of the box you need to keep in mind few things. The first step is brainstorming. Work on a problem and try to figure out any possible solution. Don’t say, ‘That won’t work’ or, ‘We can’t solve this problem,’ but say, ‘Why won’t it work and how can I make it work?’ Start thinking that there is no boundary on what you can imagine. Next is to learn new things, and by new things I literally mean anything. It can be something like learning a new language or how to write blogs or make videos or anything that you wish. This increases your thinking power, your inner potential and you become more open to new ideas and thoughts.